There is only one way to describe seafood in Hawaii- effortless. And I discovered that on my recent trip there with a friend. Being that fish is readily available, Hawaiian chefs don’t try too hard and neither do they care about the fuss and frill. They also don’t believe in plating much, which I’ll admit I’m used to in Chicago. But I guess when the fish is so fresh, you let it do the talking. So here are some highlights from what I ate and drank in Hawaii. During the first part of my trip in Honolulu, I got to try Hawaiian Pizza for the first time. I am not a fan of pineapple on my pizza (I know, I know!) and rarely like my sweet and savory mixed together. The compromise was the Shrimp Teriyaki Pizza from Flour and Barley located in Waikiki, the neighborhood we were staying in Honolulu. A crispy, colorful pie showed up with Teriyaki flavored shrimp, mozzarella, Nori Furikake, and...Kimchi Slaw! Yes there was kimchi on my pizza and it was phenomenal. The crispy shallots garnish added a fun crunch too, and I picked every last one that had scattered on my plate. The pizza was gone within minutes, and I had now pushed my envelope for sweet tasting pizza, which was a feat for me! At the same place, I ordered my favorite drink from the trip (which I didn’t know at the time) - The Waikiki Sunset. While fruity cocktails are dime a dozen in this paradise state, this drink stood out because it managed to achieve both refreshment and sweetness. Coconut rum is my favorite and in this drink, nicely blended in with Chambord and fresh island juices. I can’t tell you how many of these, I had but I can confirm that it was amazing! One morning as we struggled with jet lag, we drove 30 minutes to a coffee shop in Kauai, called Little Fish Coffee which was located in the beautiful, artsy town of Hanapepe. I had read about this place on one of the flights we took in between islands, and it had stuck with me. I instantly ordered their Honey Nutmeg Latte I had been dreaming about on the drive there, which was frothy and sweet in right proportion. But the pleasant surprise was the Bagel with Cilantro Pesto cream cheese I ordered on the side. Hands down the best bagel ever! The café also offers fun smoothies and Acai bowls if you’re aiming for something healthier. All Very Good! One of my favorite dinners was at a restaurant also in Kauai called Tidepools, located at the Grand Hyatt Resort and Spa. While the ambiance itself was exquisite, the food was above par too. There I had their Local Snapper, which came steamed in bamboo leaves, with stir fried vegetables, soba and samen noodles, and a tantalizing chili garlic sauce. The fish was so flaky soft emitting mild hints of bamboo that had seeped in it. A nicely crafted dish indeed! Hawaiians love shaved ice. To be honest I’ve never really understood the fuss about ice with syrup on it. But when its 80 degrees and you’ve baked in the sun all day, it sounds pretty darn good. So we headed to Uncle’s Shave Ice and got a large serving of it, with watermelon, strawberry and blue raspberry syrup. I instantly got what the hype was about and can say now that I am a fan. Another unforgettable meal for me was at Red Salt located at the Koa Kea Hotel. I had their Shrimp Bisque because I was craving soup, and since the weather there was a little cooler at nights. Serving upscale and more modern fare, I finally got some fancy plated food I had wanted to see on my trip. The bisque was a special on the menu, and neither thick nor runny in consistency. The taste was what most people would hope for with their food, flavorful but not overly spicy. I had my favorite dessert here too; theDark Chocolate Macadamia Nut Torte with a ginger crème fraiche. I think you get the point. For more casual, cheap eats, The Shrimp Station would be my pick. We stopped at this shack on the way to Waimea Canyon for a platter of their Cajun style shrimp, that came drenched in olive oil, garlic, white wine and a classic, creamy Cajun sauce. I chose boiled potatoes for my starch, but rice would’ve worked too. This dish will get your sinuses flowing, but will be well worth it. My last meal in Hawaii was memorable, just like I had hoped for. I finally got us reservations at Yauatcha after a week of trying! That was awesome enough, in addition to dim sum I had been craving. This is a restaurant I had been waiting to try, and it has only a few locations around the world (only two in the U.S.). And why wouldn’t I want to try gourmet Asian dim sum cooked European style? Many rounds of shrimp, crab and duck dumplings were consumed between my friend and me. I also highly recommend their Prawn and Crispy Beancurd Cheung Fun if you get to go. 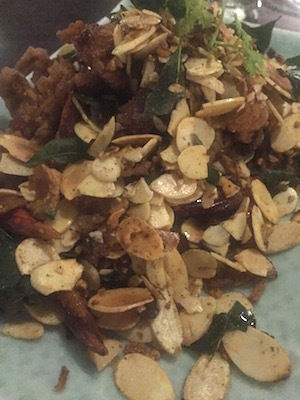 The highlight however was the Crispy Soft Shell Crab with Almond and Chili, which we ordered with their egg and scallion fried rice. The former was spicy and the latter balanced it perfectly. I think I can still smell the aroma from the steaming rice. Both dishes were delicious! You're probably wondering why I haven’t mentioned poke yet. Yes, I did have all different kinds of tuna, salmon and hamachi poke on my trip, which is available everywhere from restaurants to grocery stores. One particular one being Foodland, so check it out when you're there! I could go on and on but for food this would be a good start in Hawaii. There is no shortage of good fish on these islands, and I can only imagine what I’ve missed out on the islands I am yet to visit.